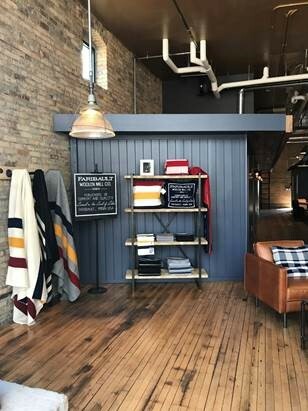 Faribault Woolen Mill opens on Washington Avenue S.
When hearing about a new home goods store opening on Washington Avenue in downtown Minneapolis, many would assume it would be in the happening hood of the North Loop. 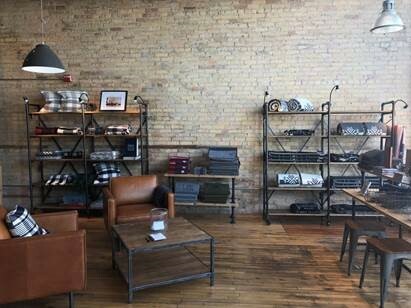 So it was a surprise to travel to the lesser known portion of Washington Avenue S. last Thursday for a private event to celebrate the opening of Faribault Woolen Mill Co.’s new retail space, its first brick-and-mortar store outside of Faribault, Minn. The company has a large retail shop in Faribault and has also done retail pop-ups such at the Mall of America, but it doesn’t have any other standalone stores. “We like to be unique,” said Tom Kileen, chief executive of Faribault, at the event. The 1,540-square-foot space at the corner of Washington and 11th avenues South used to be the site of marketing agency Humdinger and Sons (which moved to the North Loop). Faribault, which is leasing the space, had a soft opening of the store in July. The store carries the gamut of Faribault products including a special purple tailgating blanket. The store is open on weekdays from 3 to 6 p.m. and Saturdays from 9 a.m. to 2 p.m. Kileen said the store is also open on select Sundays that coincide with Vikings games. “We are trying to figure out the flow of the neighborhood right now,” he said. In addition to the space serving as a retail and branding store, it also doubles as a satellite office. There are two ecommerce and marketing employees that office out of the space regularly. Washington Avenue has seen an explosion of development in recent years. While there has been a growing community of retail shops on the northern side of the boulevard in the North Loop, in the part of Washington Avenue that runs South of Hennepin Avenue there is still very little retail outside of restaurants and bars. That will likely begin to change as some of the last remaining vacant lots are developed.